Jiwa Damai offers spacious lounge and dining area for social gatherings. We have a newly-built health room , a pool filled with natural spring water. Relax in the sun and cool down in the pool. 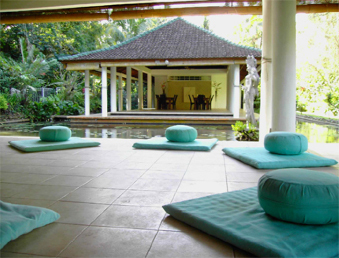 We offer two unique yoga and meditation spaces, and a daily early morning yoga and an evening Heart meditation. Our kitchen serves health-conscious cuisine for body and soul. We use local farm products mostly grown in our gardens. In combining our ingredients with careful flavoring we try to provide a balanced and nutritional balinese vegetarian and vegan cuisine. Jiwa Damai offers 6 tastefully decorated guest rooms in a minimalist modern style. They are designed with great attention to detail, using mostly natural materials. We have rooms with either a king size, queen size or two twin beds and a large sofa which can be used as an additional bed. A ceiling ventilator and mosquito net complement the comfort. Four of our rooms have built-in bathrooms, the other two rooms have a private bathroom which is joined to the room. Hand colored batiks, stone carvings and furniture reflect the wealth of the local arts and crafts. 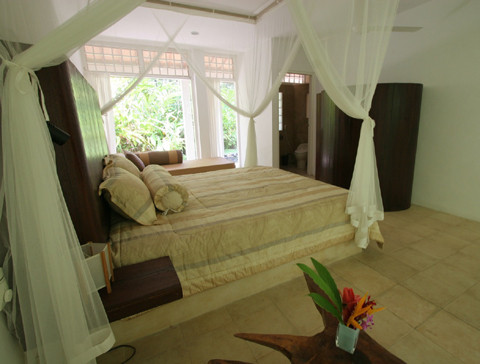 Frangipani and Gardenia room are equipped with twin beds and a sleeper couch with in door bathroom. Lotus offers a king size bed and a sleeper couch with an indoor bathroom. Sandal and Cambodia rooms contain twin beds and a sleeper couch with an outdoors private bathroom. Bamboo has a queen size bed and a sleeper couch with an indoor bathroom. 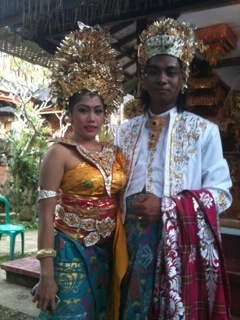 The two Lumbungs in the garden are traditional Balinese houses made of wood and bamboo. Kupu Kupu and Alamanda can accommodate two or three people and are equipped with a private bathroom. 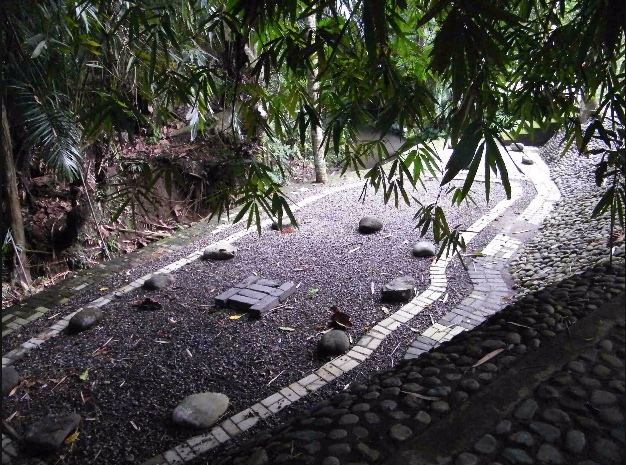 The “Place of the Tree Spirit” is a unique meditation space, located right next to a small river and shadowed over by two giant trees, provides a special energy. A powerful place where guests can experience tranquility and re-connect to the life-giving qualities of the earth. Jiwa Damai is a retreat place to calm down and relax in alignment with nature, learn about tropical fauna and flora, find time for reflection and contemplation and discover your own strength. 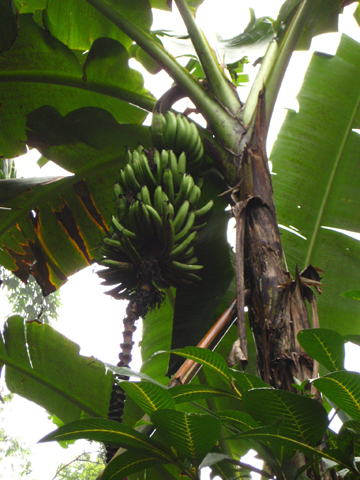 Our permaculture garden is designed in accordance with nature. We practice sustainable biological gardening based on EM-Technologies (effective microorganisms). 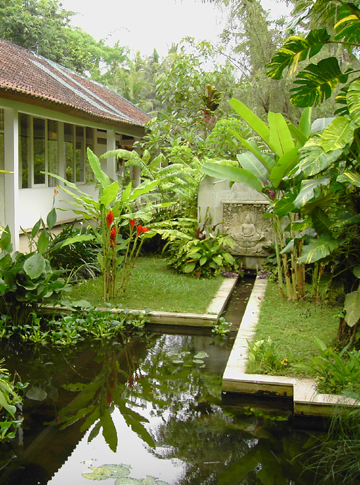 One area of the garden contains a variety of medicinal herbs, in other areas we grow plants for Balinese ceremonies as well as organic vegetables and fruit. 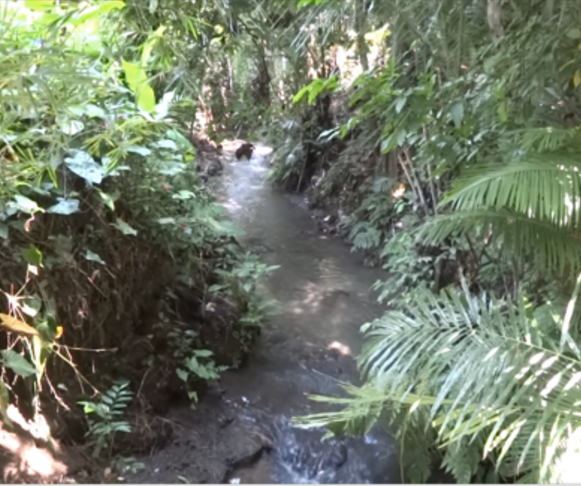 One focus is to preserve rare species of indigenous plants, another to harvest coconuts and use local traditional methods to produce extra virgin coconut oil. The hearth at the center is surrounded by especially chosen Lava stones, which provide sitting facilities. It lends itself to meditation as well as fire ceremonies. As part of your stay you can experience a traditional Balinese dance, see the beautiful temples, take part in temple ceremonies and processions, learn about local herbal remedies or see how coconut oil is produced. We gladly arrange individual activities and excursions to make your stay in Bali memorable. Our excursions are real insider-trips – besides showing you the main tourist attractions we also take you to places away from the mass tourism, enabling you to experience Bali’s beautiful nature and gain a true insight into Balinese culture and traditions. Contact us to plan your next retreat or workshop.